If you want to understand clearly the collection process using our DNA test kit, you should follow these visual instructions carefully. The process needs to be repeated for every individual participating in the test. These instructions will also be included inside your kit. Our DNA test kit contains oral swabs (also called “buccal swabs”). Watch our brief sample collection video to learn how to collect your samples or read the more detailed step by step instructions below. The DNA test kit contains a number of differently coloured envelopes. The kits are usually pre-packed and will include four swabs per person for up to three people. On the inside of each envelope you will find 4 swabs. We recommended not eating or drinking for a minimum of half an hour before you take the oral samples. Fill out the submission forms as well as the details on the envelope/s making sure everything is filled in clearly and correctly. Please print in block capitals. 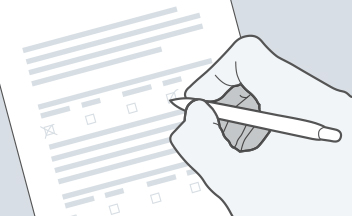 This form will authorise us to analyse your samples. If you send in forms that are not properly filled in, your testing will be put on hold and you will be asked to send us new forms. Take the swabs out from the envelope. The swabs will be wrapped individually in plastic wrappers which may be discarded. Whilst removing swabs, try not to touch the cotton ended part with your fingers as this could contaminate the DNA sample. Now you can proceed to actually collecting the DNA samples by firmly rubbing the swabs on the inside of each cheek (30 times each or for about 1 minute). Be certain to move the swab over the entire inner cheek surface. This action should be firm but not aggressive and should not be uncomfortable. 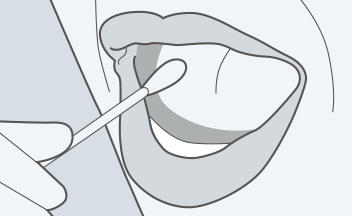 Repeat this process for the same individual with the second swab. The next step is simple: allow the swabs to air dry. This is best done indoors. One hour is more than enough. When in the process of drying your swabs remember you want to keep them as clean as possible so make sure the swabs do not get mixed up and that swabs from different people do not touch each other (we suggest placing swabs from different test participants in a separate glass for drying). Also make sure that no dirt comes into contact with the swabs. After one hour, the swabs will be dry. There is not need to check if they are still damp by touching them. After the one hour drying time is up, you can place the swabs back inside the envelopes. It is crucial to do this with care so as not to place the wrong swabs in the wrong envelope (for example, blue swabs in the pink envelopes). Such errors can create delays when we receive your samples. 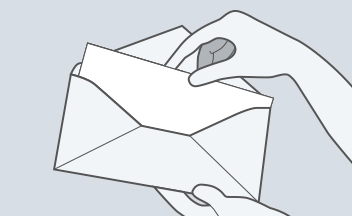 Send all samples and consent forms back using our pre-addressed envelope. If you are pressed for time why not create your own testing kit from home to save time and money? EasyDNA provides you with easy-to-follow instructions for you to collect and send your DNA samples today! Learn how to make your own home kit now. Drying your swabs is simple but you need to make sure you keep them clean and that swabs from different people do not ever come into contact with each other (remember there is the possibility of DNA contamination if this happens). We like to recommend that clients use clean water glasses to dry their swabs; one water glass for the swabs of every test participant, placing them cotton side up. Sample collection can be performed at any age including newborn babies. 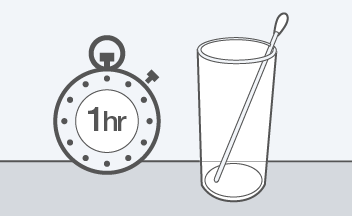 Make sure that no food or drinks (except water) have been consumed within one hour of sampling. I need a sample collection kit! You will receive your kit shortly after you have placed your order; normally within 2-3 working days. Should you need more than 1 kit or dispatch of kits to different locations, contact us before hand to have your test and kit delivery organised. We are here to assist you with all your DNA testing needs. Contact us directly. For information about our paternity testing services or other general information we suggest you visit the frequent questions.